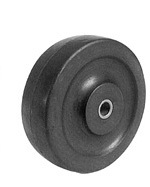 Hard rubber wheels are high impact molded with a hardness rating of 70-80 Shore (D) Durometer. An easy rolling, excellent general duty wheel with steel bearing sleeve molded into wheel center. Soft rubber wheel features include quiet operation, shock absorption, and floor protection. Soft rubber wheels are constructed of soft rubber tread, 70-80 Shore (A) Durometer, molded to hard rubber core. These excellent light duty wheels have steel bearing sleeves molded into wheel centers. Delrin wheel bearings may be selected as an option for hard and soft rubber wheels. Please call 1-888-904-9531 for more information and to order rubber wheels.